On May 24th, the Ryūkyū Shinpō Newspaper published a cultural column titled “Easy to understand Okinawan history ~ Interpreting social changes.” The author is Mr. Kurima Yasuo. Born in 1941 in Naha City, he is an Okinawa historian, agricultural scientist and emeritus professor at Okinawa International University. In his article, the words “Bushi · Samurē · Shizoku” which are often used in the world of Okinawa karate are explained in an easy-to-understand manner. Therefore we take the liberty to reproduce a part of the article in Japanese and present a translation below. According to Mr. Kurima, there is very little war in Okinawan history. Furthermore, Bushi (武士) do not appear. There existed Aji (按司) or chieftain. Some people believe that these were Bushi, but Aji were not Bushi. Bushi appears in Japanese history but do not in Chinese and Korean history. In Okinawa also exist the words “Bushi (ぶし)”, “Samurē (サムレー)” and “Shizoku (士族)”. Still, there were no Bushi (武士) in Okinawa. In the “Okinawa language dictionary” edited by the National Institute of Japanese Language Research, it is written “Tatsujin – expert. 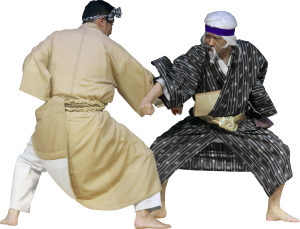 Person who excels in Bugei or karate, a person with great power”, and is supplemented with “alteration from Bushi (武士)”. While linguistically duplicating the word “Bushi” of Japan, it has not the same meaning. It is used “providentially” (changing the meaning). Looking only at the words, the Bushi (武士) of Japanese history is different from the “Bushi (ぶし)” of Okinawa. With early modern times appeared “Shi (士)”. This kanji should not be read “Shi” but “Samurē”. This is based on Higaonna Kanjun’s “The class system of the former Ryūkyū” (1909) and “The history of the Ryūkyū” (1957). While this word relates to the Japanese word “Samurai”, one shouldn’t confuse it with Bushi (武士). In Japanese history, before the appearance of Bushi, there were people who were said to be “Saburau” (from the verbs “to serve” 候ふ／侍ふ). They “served” under emperor and aristocrats; that is, people “watching over and awaiting alongside with stillness”. Some also had martial/military power. They were military officers (武官). Along the way, this led to “Bushi (武士) = Samurai (侍)”. However, since Okinawan “Samurē” were not armed, they differ from the previous ones. In the early modern times of the Ryūkyū, people who worked for the royal government (meaning civil servants) were called “Samurē”. With modern times appeared “Shizoku (士族)”. This was used for the first time as one of the “Zokushō – family names” after the Meiji Restoration. Within Zokushō were “Kazoku – nobility”, “Shizoku – person with samurai ancestors” and “Heimin – commoner.” The former Bushi status people were regarded as “Shizoku”. To add more, times changing, those who were no longer Bushi became “Shizoku”. And Ryūkyūan “Shi (Samurē)” also became considered as “Shizoku”. Without pointing out this, using the term “Shizoku” is a source of misunderstanding.